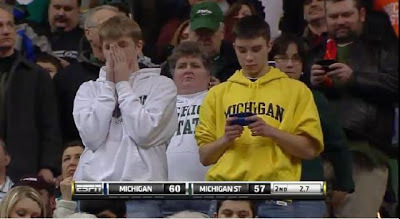 Its been 1,181 days since Michigan has beaten Michigan State in football or basketball. Michigan just beat little brother 61-57 at the Breslin Center. The streak Izzover! No couch is safe in East Lansing tonight. Aaaaaaand, the Michigan women's team beat Ohio State in Columbus 69-66 after being down by 14 in the first half. Go Frickin' Blue! What a night.